Sometimes leading a team, project or organization goes well. Sometimes it doesn’t. Jennifer Bridges, PMP, shows you crisis management techniques to help you successfully lead during a disaster. Jennifer noted that whether you’re leading a team, project or organization, things are either going well or poorly. It’s rare to land in the middle. It’s easy to lead when all’s well. But it is in a crisis when the true meaning of leadership is defined. A crisis is a test for the leader to see whether they can step up and right those wrongs. There are countless types of ways things can go wrong with a team, project or organization, but Jennifer focused on the types of crises that are common and how sound crisis management can help. These crises impact teams. Jennifer recalled working with a team member who was gravely sick. The person needed a transplant but had to wait two years until a donor was found, which then put the team member on a short-term disability leave. Another was a team member who had a close personal relative injured in a car accident. That took the team member away from the project to deal with a family emergency. She had to overcome a lack of project resources. Yet another crisis Jennifer remembered involved a renegade contractor who made changes to the production site but was on vacation during the implementation phase, which caused all sorts of problems. Then on the project side, Jennifer recalled one in which the market was doing poorly. That resulted in costs going up for the work. She had to do some budget cuts, but it also impacted human resources. Technology initiated another crisis. It impacted the scope of the project. But that’s not all. The project came in hundreds of millions of dollars over budget, and it also impacted hundreds of people. Then Jennifer recalled working on a project where the company merged with another company that had a very different corporate culture. This created a great deal of stress on the CEO, which you can imagine was not good for the project. All these situations are not unique and can happen to anyone. How can you use crisis management to keep progressing, stay on schedule, be productive, stop the bleeding and keep your team focused? The answer is that you must plan. In the team member scenarios, you must do your best to identify risks before the project even begins. Do your best to identify risks, create a resource backup plan to determine who steps in to pick up the slack from the missing resource and always use your emotional intelligence to treat the situation with compassion, understanding and reassurance. When it comes to projects, you also must evaluate the risk and identify those possible problem points to know how you’ll respond when and if they occur. It helps to create a change control board that makes decisions and approvals during periods of change in the project. Also, know your team and who you can go to for creative, people, numerical or structural problems. 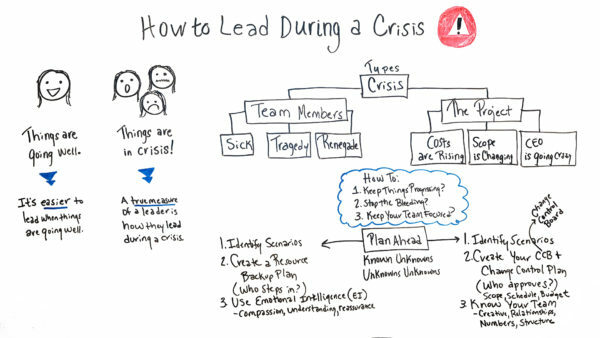 Pro-Tip: In order to lead during a crisis, you have to be able to spot a crisis before it impacts the project. Learn what the red flags are for schedule, budget, performance, scope, quality and governance risk are. Take it Further: Sometimes it’s impossible to predict when a crisis will strike. That’s why it’s so important to have a business continuity plan. Learn how to keep your business or project running in the event of a disaster. Today we’re talking about How to Lead During a Crisis. Well, it doesn’t matter if you’re leading a team, a project or an organization, we often find ourselves that things can be going really well, or things can be in a crisis. It’s rare probably to find ourselves in the middle of those, but it’s easier to lead when things are going really well. And you probably heard a true measure of a leader is how they lead during a crisis. So, today what I wanna talk about are a couple of different types of crisis. They’re not the only type of crisis that occur, but they’re common ones. One is for team members, the other is regarding a project. So, I remember on one project specifically, we had a key team member who was up for a kidney donorship to a sister, had actually been on the donor list for her for two years but they had to wait for the conditions to be right. So, all of a sudden, the conditions were perfect, and they called him up for the donorship. So, he was out not only during the time to give the kidney donation, but he had his own recovery time as well, so he was out for a short-term disability. The other was we had a tragic accident that had occurred. So, one of the key team members had to not only take care of his own family but multiple family members. And then also, we had their renegade contractor that we hired that we found out later during the implementation weekend when he was on vacation, that he had been making multiple changes to the production site that weren’t incorporated into the development machine. So, when we did the upgrade, it overwrote the production and that system was down for three days. So, what we had to do is, we had to make some changes and really work together as a team to plan for how to keep things going. The other is the project. So, I remember one specific project where the market was really bad. So, because of the market changes, the cost of the project just skyrocketed. So, what happened was we had to go in and start cutting costs, but not only cost, it also impacted significant numbers of people resources on our project. And then likewise, another one, a new technology, a new software we were implementing, it was so new that we had to keep changing the scope. I remember all the time the team was in lockdown mode because the scope had changed. So, we had to replan everything and because of that, again, it not only impacted the project, but it was $500 million over budget that impacted some of the jobs of 200 and 300 people. And then another one was where two companies were merged together with two different type of cultures in the company. So, it caused a lot of stress for the CEO of the company that was being merged but was not the dominant player. Not only did it impact him, and he was going crazy because of all the different stresses, but it also added a lot of stress to all of the team members in the organization. So, what do we do? How do we account for that? Here’s some questions that we need to think through. How do we go through these different things of the crisis and how we keep things progressing forward? How do we stop the bleeding when things go really bad? And how do you keep your team focused during this crisis? Well, one thing we wanna do is plan ahead. Sometimes we can…there are known unknowns that we can plan for. We can think about, what happens if, you know, something happens to some of our team members? What happens when, you know, the cost or the scope changes? You know, we pretty much need to plan for that anyway. But what about the unknown unknowns with mergers that come up out of the blue or the kidney donor comes up, like, how do you plan for that? So, in the case of the team members, we need to identify the scenarios that might occur. We need to create a resource backup plan, we need to know who’s going to step in and we also need to be able to use emotional intelligence during this period of time. We need to use compassion, understanding, and reassurance to not only the people who were impacted directly but also the team members. And then here in the project, we need to identify the scenarios. It’s pretty common that cost and scope is impacted. It’s not usually common that there’s gonna be maybe a merger or an acquisition, but you wanna create your change control board and your change control plan. We need to know who approves these changes, who approves the scope, the schedule, the budget. We also wanna know our team members, we wanna know who we can call on if we need, like, creative, innovative solutions. Who are creative thinkers? Who are our relationship builders? Who can help us create strategic relationships that we can call on? Who are numbers people who can analyze the different scenarios and the cost-benefit analysis? And who are the people who know the structures who can put the framework and the processes in place when things change? But these are some things that are impacted during a crisis, and if you need a tool with additional resources that can help you lead effectively, then sign up for our software now at ProjectManager.com.